Been waiting for a deal like this for a while! All currently in stock - probably not for long at this price though! Just can't get into this game what so ever. I can see the appeal an why it's done so well. Just can't get into this game what so ever. I can see the appeal an why …Just can't get into this game what so ever. I can see the appeal an why it's done so well. I didn't understand it at all until I played it, and I got really into a game of it whilst playing on a random server a few years back. I'd love to play it in VR when it's all properly available and affordable (not the gear VR version). The appeal is you can build whatever you want in it. So the purpose is to build what you want? That's it? No missions, objectives, story? So the purpose is to build what you want? That's it? No missions, …So the purpose is to build what you want? That's it? No missions, objectives, story? Didn't they add in a way to "complete" the sandbox mode? Something to do with the "Nether"? Great price especially for game sharers. Debating whether to get this or the “One for all” version. Great price especially for game sharers. Debating whether to get this or …Great price especially for game sharers. Debating whether to get this or the “One for all” version. I wouldn't dwell on it too much, It's gone sliding down the pages of 'availability' on CDKeys, so I guess it'll be OOS soon. There are achievements. There are 3 bosses. No story. You make the story, you make your own objective. It's a sandbox game, so unless you go into the box/game wanting to build a sand-castle/house, you probably wont like it that much. Survival, exploration and discovery probably covers the bases. Survive for as long as you can againsy a wide range of enemies, explore new terrains, caves and discover new elements that can aid you, and find new enemies to battle, go to the "Nether" realm and battle the Enderdragon at "Tthe End". Quite a good game back in the day with split screen co op, seems like its lost its way now Microsoft bought Mojang, the company that made the game. That's for the disc version, I don't think that applies to the digital download. "Owners of the disc version of Minecraft: Xbox One Edition will have until January 30th 2018 to have played Minecraft for five or more hours in the past 12 months OR purchased a DLC Pack. There is no cutoff for digital Minecraft: Xbox One Edition owners." So I think if you get this version then you'll have both editions although I think development is more focused on the Better Together version now. Question, Can you use the Explorers pack on Better Together. I have disc version with favorites pack. Just need to buy story mode then? How ridiculously confusing. Simple question from my simple brain - If you get this digital version for 10 quid, are you eligible for the all singing and dancing FREE update in the near future? How ridiculously confusing. Simple question from my simple brain - If you …How ridiculously confusing. Simple question from my simple brain - If you get this digital version for 10 quid, are you eligible for the all singing and dancing FREE update in the near future? According to the Minecraft site, yes. Does anyone know if Minecraft on the Xbox One is still cheaper if you owned the 360 version? I think it was at launch but perhaps for a limited time. That's for the disc version, I don't think that applies to the digital …That's for the disc version, I don't think that applies to the digital download. "Owners of the disc version of Minecraft: Xbox One Edition will have until January 30th 2018 to have played Minecraft for five or more hours in the past 12 months OR purchased a DLC Pack. There is no cutoff for digital Minecraft: Xbox One Edition owners. "So I think if you get this version then you'll have both editions although I think development is more focused on the Better Together version now.Question, Can you use the Explorers pack on Better Together. The 4k dlc isn't out until next year, so I'm now sure how you'd know until then? The 4k dlc isn't out until next year, so I'm now sure how you'd know until …The 4k dlc isn't out until next year, so I'm now sure how you'd know until then?
? Whats 4k dlc got to do with the version of minecraft on the store? "There is no cutoff for digital Minecraft: Xbox One Edition owners"
Has anyone purchased the Minecraft edition from this deal and if so can they please confirm if it is the original disc based "Minecraft Xbox One edition" (only digitally) or is it in fact the new "Better Together" edition, simply titled "Minecraft" which you now get free if you have the original disc version? I would like to know as we have the disc version already and the "Better Together" version that we got free but would get this if you get a digital version of the original "Minecraft Xbox One edition". Phew, this is getting very confusing!!! Because the original question was .... and the criteria is..."There is no …Because the original question was .... and the criteria is..."There is no cutoff for digital Minecraft: Xbox One Edition owners"
Ok but that's not question I replied to I replied to the person who was choosing between the original console version and the new better together version. 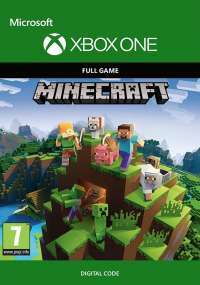 Has anyone purchased the Minecraft edition from this deal and if so can …Has anyone purchased the Minecraft edition from this deal and if so can they please confirm if it is the original disc based "Minecraft Xbox One edition" (only digitally) or is it in fact the new "Better Together" edition, simply titled "Minecraft" which you now get free if you have the original disc version? I would like to know as we have the disc version already and the "Better Together" version that we got free but would get this if you get a digital version of the original "Minecraft Xbox One edition". Phew, this is getting very confusing!!! So have you us the cdkey code today? What version did it download? 1% Quidco + 5% discount for paying with Apple Pay. I paid £9.49 excluding any Quidco. Can someone who's purchased the explorers pack please enlighten me how to get access to it.I entered the code for the base game which installed fine then entered the code for the explorers pack redeemed it but hasn't showed up as an update on my downloads.I can't even find the explorers pack on the console's store page, only on my PC but showing as buy at £19.99.Checked my purchases on my account and it's there but can't find an option to download it to the console.Any suggestions would be appreciated.